With a career that spans five decades, 36 albums and countless radio and television shows, Eric Bibb is one of the leading blues artists of his generation. His soul, gospel and folk roots, make his blues honest, powerful, enjoyable and accessible. Born in New York City in 1951, Eric is the son of Leon Bibb, a senior figure on the New York folk scene of the 1960’s. Eric’s godfather was actor, singer and activist Paul Robeson and his uncle was the composer and jazz pianist John Lewis, founder of the Modern Jazz Quartet His parents’ house was a centre of artistic life where “getting to meet Rev. Gary Davis, Dylan, Judy Collins or Odetta had a profound effect on me”, he reminisces. Bibb got his first steel guitar at the age of seven, and followed the advice given to him by Bob Dylan to "keep it simple, forget all that fancy stuff." Bibb studied double bass, vocals, classical guitar, and piano at New York City's High School of Music and Art, then, when he was 16, he played guitar in the house band for his father’s TV talent show, ‘Someone New’. In 1970, Bibb left New York for Europe, eventually settling in Stockholm, where he made several albums. His breakthrough came in 1994, with the album, ‘Spirit & The Blues’, which led to tours of the UK, America, Canada, France, Sweden and Germany. Over the course of many years, Eric has managed to gather a faithful and multinational ‘tribe’ of musicians with whom he has recorded and performed. The list includes such luminaries, Taj Mahal, Pops and Mavis Staples, Charlie Musselwhite, Guy Davis, Maria Muldaur, Bonnie Raitt, Mamadou and Toumani Diabate, Glen Scott, Solo Cissokho, Cedric Watson, Larry Crockett, Jerry Douglas and Habib Koite. While hosting ‘House of Blues Radio Hour’, Elwood Blues (a.k.a. Dan Aykroyd), declared to Eric: “You are what the blues in the new century should be about.” Another critic wrote: “He has all the ingredients for stardom – handsome good looks, a voice as strong and soulful as they come, the guitar chops to hold his own against the best and he writes compelling, sensitive songs. His blues are clean, beautifully sung, soulful and upbeat”. Always the prolific songwriter, Eric is forever brimming with new musical ideas and there’s no dimming in his enthusiasm for performing. This tour is hot on the heels of his latest album 'Lead Belly’s Gold', which has received outstanding reviews and debuted at No 5 on the French Jazz charts. You can see Eric Bibb at The Apex on Monday 9 May at 7.30pm. 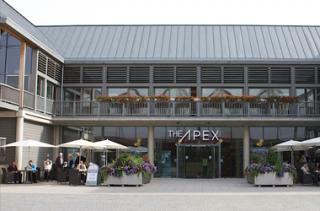 Tickets are £25, ring The Apex box office on 01284 758000 or see www.theapex.co.uk for more details or to book.